There is a horrible paper in this week's Proceedings of the National Academy of Sciences (hat-tip Desdemona Despair), which looks at how the limits of human physiology interact with upper-range global warming scenarios. The bottom line conclusion is that there is a small - of order 5% - risk of global warming creating a situation in which a large fraction of the planet was uninhabitable (in the sense that if you were outside for an extended period during the hottest days of the year, even in the shade with wet clothing, you would die). To give you a feeling for the likely uninhabitable regions, it's the portions of the map above that are in the white or pink/purple color (above 35oC wet bulb temperature on the scale). As you can see, it includes most of the eastern US, much of inland Brazil and Latin America, tropical Africa, pretty much all of India, portions of northern China, and most of Australia. Plenty to qualify as a "Risk to Global Civilization", I think. The paper itself will cost you $10 to read, unless you are already a PNAS subscriber, so let me try to summarize the main reasoning and you can decide if it's worth your $10. More precisely, the wet bulb temperature being plotted here is the average annual high that extended for at least six hours, and the data is for 1999-2008. So the filthy-hottest parts of the planet become clear - the tropics of course, with the inland Amazon and northern India worst, but the eastern US is not far behind, as also northern China and much of Australia. So how high a wet bulb temperature can people tolerate? The paper doesn't cite much experimental data (apparently the Nazi scientists missed this in their program) but what is known is that skin temperatures above 35oC (which is 95oF) are fatal for an extended period (your skin needs to be at least a few degrees cooler than your core temperature of 37oC/98oF so that heat can be conducted from the blood to the skin in order to shed metabolic heat). So it's reasonable that if the wet bulb temperature is above this for an extended period (they take six hours) you won't be able to survive. In fact, given that a human who needs to be outside probably won't be sitting in the shade with wet clothes and a big fan, the maximum survivable wet bulb temperature may actually be a degree or two lower. At the moment, as the map above shows, nowhere on the planet gets up that high. The highest is in the low thirties - pretty damn unpleasant, no doubt, and no-one is going to do a whole lot outside under those conditions, but not actually fatal for all but a small minority of folks (probably with other health conditions). You can see that, even though the most likely climate sensitivity is around 3oC there's an appreciable amount of probability for sensitivities above 6oC (which is about 10oF). Maybe 5-10% depending on which probability distribution. Hard to be super-precise, but at any rate, noticeably higher than, say, your lifetime risk of dying in a car crash (1 in 83 for Americans, according to this article). This is the paper's estimate of the annual peak six hour wet bulb temperature in a 12oC hotter world. As you can see, most of the world's major population centers will be uninhabitable outdoors during heat waves (again, you want to look at the places over about 35oC). We will have to retreat to places like Scandinavia (which will feel as hot as tropical Africa today) and northern Canada, or just skulk inside with lots of air conditioning. But in that scenario, I think all bets are off for global civilization as I expect people in the poorer countries in the developing world will basically all flee, and who knows what the effect of that would be. Update: Oops - I forgot to mention the PNAS paper's authors, Steven Sherwood of the University of New South Wales, and Matthew Huber of Purdue University. Don't let the lack of comments bother you, Stuart. This is truly shocking. I'm sure everybody is just stunned into silence. That first chart deserves to become the best-known graphic in the world. just an echo.. the first chart deserves the attention of everyone who is expected to be qualified for basic statistical analysis...and then some more. That definitely included me, although the "5%" chance - still unacceptably high - brought me back. I mean, look at that. Pretty much all of the non-Antarctica land-masses in the Southern Hemisphere would be inhospitable outside during the summer day-time, with the exception of Patagonia. The North America one is pretty bizarre, too - the East Coast becomes nigh-uninhabitable, while the West Coast basically turns into tropical Africa in terms of temperatures. But in that scenario, I think all bets are off for global civilization as I expect people in the poorer countries in the developing world will basically all flee, and who knows what the effect of that would be. Lots of deaths, I would imagine. In such a situation, most of the habitable, stable countries would probably be operating under similar rules to those of countries trying to prevent arrivals of people infected with a highly deadly and infectious disease. That's assuming many of them even make it north under those conditions (although presumably it would be a lot time coming, so you'd see a steady ramp-up in climate refugees). After a while, exposure under those conditions plus starvation would kill most prospective migrants if they were ever unfortunate enough to end up in an area without air conditioning in the day-time on the way north. How would the rise in sea level interact with all this? If the planet is 12 C warmer on average, I'd expect the ice caps to melt beaucoup rapidly, and in a more oceanic climate the extremes would be damped (relative to the average, of course). Obviously from human perspective a 100 meter rise in sea level is also, shall we say, problematic. Sort of like the difference between being hanged or shot. (Broiled v boiled?) But I'm just curious about how those interactions play out. When attending Baylor Med during the 50's I had to write a pediatric term paper at Jefferson Davis Charity Hospital. I chose insensible water loss. Jeff Davis wards were not air conditioned. Sick infants could die quickly in the heat and high humidity especially when losing fluids and electrolytes with vomiting and diarrhea. My main conclusion was that the diarrhea. wards should be air conditioned. I didn't mention another conclusion that during some months the Houston heat and humidity combination could be near borderline for sustaining human life. - Why the narrow 15C WB temp band around coasts and inland seas/lakes? Sea Breezes? Or do water bodies provide a sink of “cool”? I guess the wider black band in the Future map (compared to the Present map) is just a quantification effect due to the larger data squares? - How wide is this coastal band? Wide enough for dense linear habitations? Would this cool-width change due to sea level rise? - Going inland, this band usually transitions immediately to much higher temps, without going through intermediate temps. Why is that? - Coastal regions in the tropics, such as Central America, Indonesia, Papua New Guinea, or Arnhem Land, Australia, are not very comfortable places to live today in my experience. It’s a stretch to believe that, in the future, they’d equate in comfort to the Arctic coast of Siberia, which the common 15C Tmax (black color) would seem to show. What does this map, with its max WB temps, really indicate? Are the criteria used a good measure of livability? - Mountain ranges: In the Future map, I’m puzzled by the large 20C/Blue cool oasis over the California Sierras, Nevada and California deserts, while larger/higher/higher-latitude mountain ranges, such as the Rockies, Andes, Alps and Caucasus display no such effects. I think the reason the Sierra Nevada looks better than the Rockies, and in general the western US looks better than the Eastern US, is that it's much less humid in the west, so, if you can get enough water, you can sweat away a lot of heat. The wet bulb temperature represents the limit of what can be achieved by evaporation, and once that goes above the temperature required to keep the body core temperature stable, one is going to start to get in trouble. In the limit of 100% relative humidity, sweating does no good at all. Don't forget that as we get squashed out of the majority of the landmasses our food supplies will also vanish. So we'll boil or broil while starving to death. Maybe a small calculation I made the other day might be of interest in this context. The university in my home town has published a calculator called Chalmers Climate Calculator based on IPCC´s work. As input I used maximum available resources of fossil fuels according to peer reviewed papers from the University of Uppsala. With a temperature sensitivity of 3 C for a doubling of the atmospheric carbon dioxide content, the global temperature increase becomes 2.5 C year 2100. Thus it seems that for the worst scenarios IPCC has not considered limitations in resources. Everyone from the deep south in the US is going to move to the West...or Florida. The sort of revisionist near-term peak-coal type views are based on assuming that we will have to leave large amounts of coal in the ground because in one way or another it's a little tricky to get out, or might cause damage, so that current reserve estimates will have to get lower. That's a choice we could make, but need not make. We also could make the choice to get out larger amounts - there are massive amounts of coal that *aren't* covered in current reserve estimates (eg under the North Sea). And I think climate will end up being the largest issue that plays into those kinds of choices. I should write more about peak coal some time. You are so right, it is to a large extent up to us decide how much fossil fuel we should take out of the ground, but there are technical, sociological and economical restrictions. IPCC state that their scenarios represent plausible, alternative futures. However, no probabilities or likelihoods are assigned to any of the scenarios. All scenarios are equally valid, which was required by the Terms of Reference (SRES, 2000). 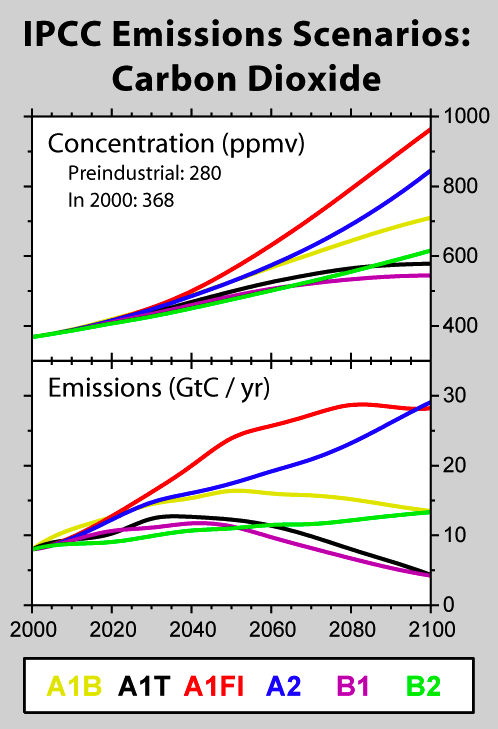 The equal probability of each emission scenario is difficult for me an others to understand as one would assume that the extreme scenarios would be less probable than the central estimates. When you use 5 % risk in your post, I understand that the prerequisite is that all IPCC´s emission scenarios have equal probabilities which I question. I should clarify. 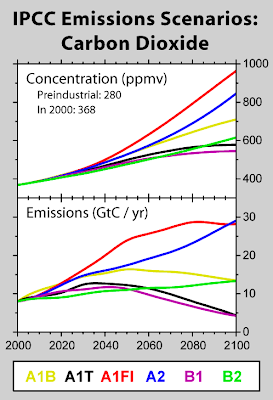 The 5% risk is conditioned on a high emissions scenario. So Ifwe burn all the coal we can get at along the lines of A1FI or a bit above, there's a 5% (give or take) risk that the climate sensitivity is high (&gt 6 C), and, if so, then we are in this uninhabitable scenario. I remember reading an article from theoildrum.com that stated the maximum bearable cot for extracting fossil fuels as being 180 per barrel (or equivilant btu in gas and coal). Knowing this plus the estimated extraction costs using today's technology we should be able to get within 10% of the maximum extractable gigajoules that we can extract. Tthis should allow us to estimate the amount of co2 that we'll emit and give us a decent 20% margin of error total co2 concentration. 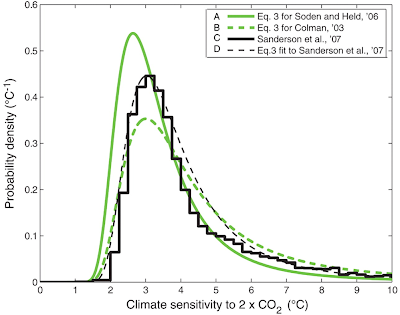 Also considering Pliocene temps (3-5C) and CO2 concentrations (325-400ppm) possibly suggest an even higher climate sensitivity over the longer term to CO2; doesn't that make the odds of 12C even at 560ppm unacceptable? Wouldn't de-icing a polar ocean be likely to be a period when there is higher probability of a higher climate sensitivity to any heating forcing due to the dramatic albedo switch? Maybe taking climate change very seriously is an urgent necessity? Can't help feeling that the only way to stop carbon emissions is to spread the understanding that it would be foolish not too. What would it take to actually get back to 350ppm? It also clear from events so far at 0.7C, that even at 350ppm large climatic changes, sea level rises and population shifts will occur which will need adapting to. Considering adaption what sort of large scale adaptation of social and commercial interaction would it take to actual stop using fossil fuels? Maybe riding a bike isn't that bad? Thanks for performing this service. I saw the abstract on Tenney Naumer's blog, which I check frequently. You did a great job of making the paper understandable. My quick take on the abstract was that it's sort of morbid and almost unnecessary to talk about what would happen to human bodies if the Earth got that hot, since the sea level would be very high and agriculture would be in big trouble. But maybe we need more reporting like this to wake people up. I'm afraid we'll have passed the tipping point before everyone agrees pricing carbon is the only way to slow it down. James Hansen for President! Given that the climate bill just died in the Senate and I am still hearing so many "experts" bloviating that this is all a hoax, it just makes me so much more angry that there is even a 1 in 20 chance that my son's children will live in a world that is unrecognizable by today's standards. I think what will happen is during a total of maybe 20 days a year we will be forced to live in shelters made of thick stone walls (>70 cm?) which would have enough thermal mass to hold the coolness of the night. Underground dwellings are also an option. We might even in some of the very hot places construct cities which are in significant part underground, so that we can wait for the heat wave to pass before going outside again. Furthermore, it would be imperative to absolutely minimize all electrical appliances usage in our underground dwellings to suppress waste heat generation. Fortunately, with some of the new LED sources we wouldn't necessarily have to be in real darkness. Our ways of life would also need to adjust. We could still do some necessary things outside, but night would be the new day. The construction crews and the farmers (of specially bred crops which can take the heat) would only work the 11:00 PM - 7:00 AM shift, until the heat wave passes. We should start training young folks to gradually change their ways of life now, and build this type of house now, so as to be prepared. Why does everyone pretend like this can actually be stopped (seeing as the human influence is minuscule compared to what's going to happen)? Surely our efforts would be better spent attempting figure out how to evolve and survive higher temperatures? If we do nothing to stop climate change, then all the worst predictions of the IPCC will come true. We will trigger a runaway greenhouse effect which will drastically change the planet. It will be a planet as different from today as todays climate is different from the Ice Ages. We don’t know what this world will look like, as it is so radically different from what we are familiar with. But you can be damn sure of one thing: it will be a world that is no longer able to support billions of people, no matter what actions are taken. I don’t think the human race will go extinct, but world population will be measured in millions, no longer in billions. Finding a nice shady spot – or a hole in the ground to hide in - will be the least of your problems in such a world. "Obviously from human perspective a 100 meter rise in sea level is also, shall we say, problematic. " Fortunately it is not likely. There are only 70 meters of sea level rise worth of ice on the planet. Thermal expansion also causes sea level rise, but for thermal expansion to make up the next 30m would require the oceans to warm to about 40 C all over the globe, all the way down to the bottom. That isn't likely.